Herbs are a fairly new addition to my garden- this was my third year with an established herb garden. I have no idea what I was waiting for, fresh herbs are amazing throughout the summer and are companions for several veggies throughout the garden, plus the added bonus of attracting many beneficial bugs. You will always find an arsenal of herbs and spices in our upper cabinet - spices can easily transform a blah dish to one that smells and tastes amazing. 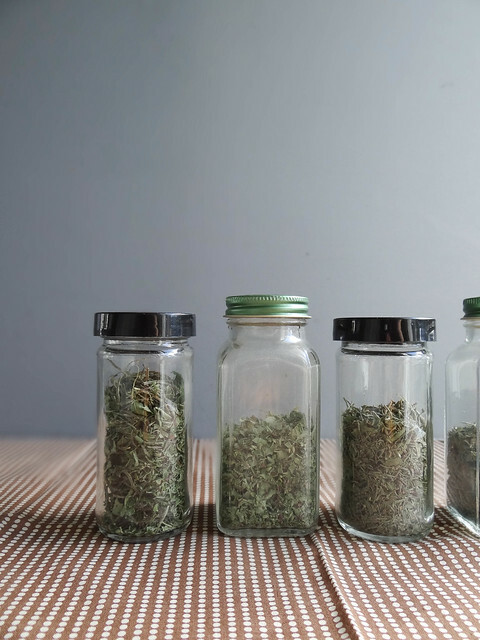 What better way to stock your spice jars for the upcoming winter months than drying your very own herbs straight from the garden, balcony or window sill. 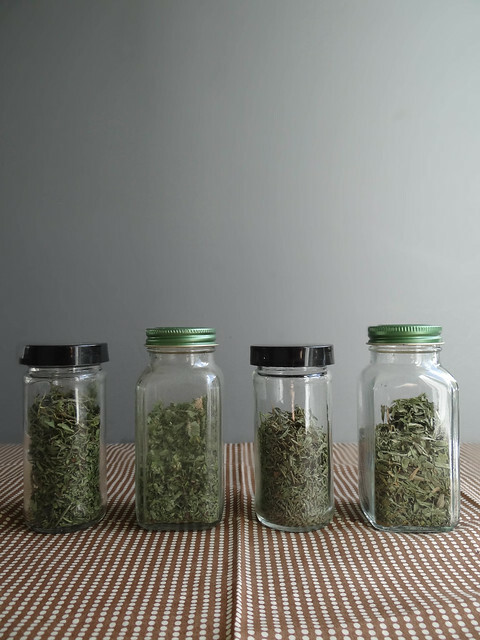 Drying your own herbs also allows you creative freedom with your herb mixes- love oregano but not crazy about thyme; add more oregano to your jar and less thyme. Cut your fresh herbs, gather each herb into a bundle (its own individual bundle). Cut a piece of garden twine or string long enough to tie one end of the bundle with enough length to secure to your drying rack/hook/area. Taking one end of the twine, tie the cut end of the herb bundle- set aside and repeat with remaining bundles. Select a location that is warm & dry (dark if possible). 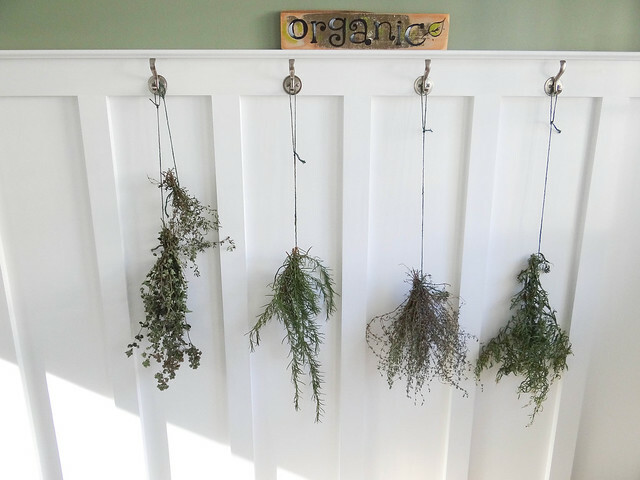 Hang each herb bundle upside down securing one end to a thumb tack, hook or other drying device. Alternatively you may lay the herbs flat across a screen that is propped on a drying rack (which allows the air to circulate under the herbs). 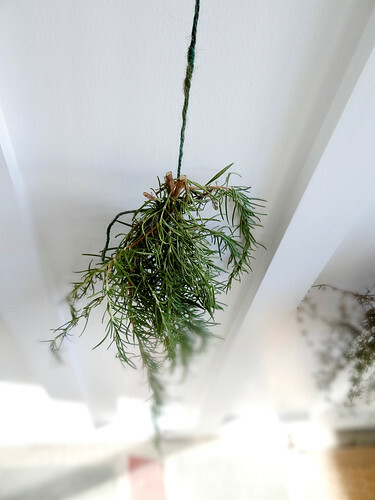 Allow herbs to dry a minimum of 1 week, hardier herbs such as rosemary may need up to 3 weeks to fully dry. Once dry, simply remove the dried herbs from the woody stems into bowls. 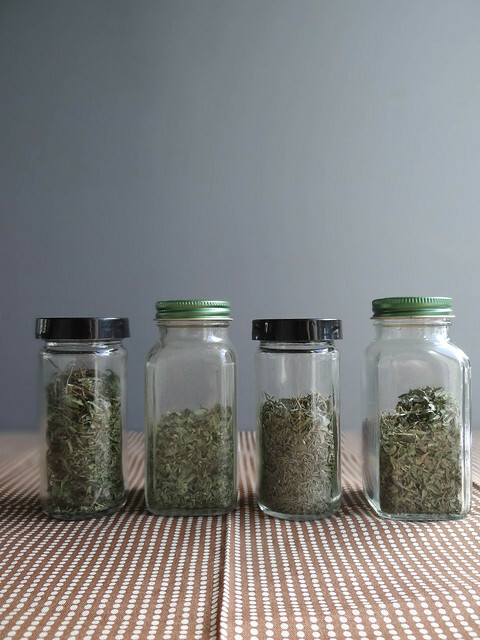 For a more rustic herb blend simply break the herbs up into smaller pieces with your fingers, if you prefer a finer herb blend, place the herbs in a small processor and process until you reach your desired consistency- I like this method especially for rosemary. 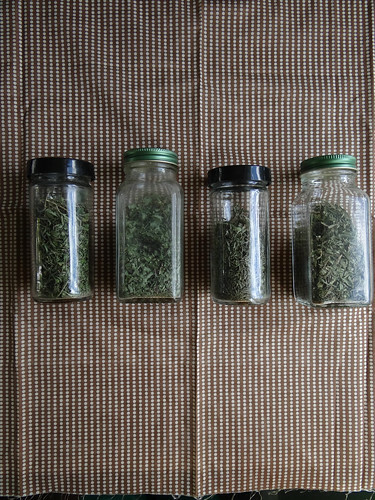 I like to arrange 1 bowl for each herb, this separates the herbs making it easier to create blends. 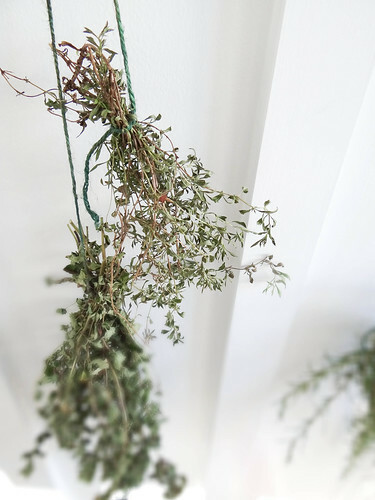 i've always wondered how to dry herbs! doesn't look too difficult at all! So easy, I have no clue why it took me so long to do it myself! Fantastic post! Growing up my mom dried all her herbs and still to this day hangs giant bunches of her mint for tea all winter (my FAVE). This is so economical and superior to bagged teas too...thanks for this great series Heather! I know so many people who grow their own tea for the winter, mint makes me a little nervous as I read it can be invasive, but I love the idea of growing some for mint tea! So easy! 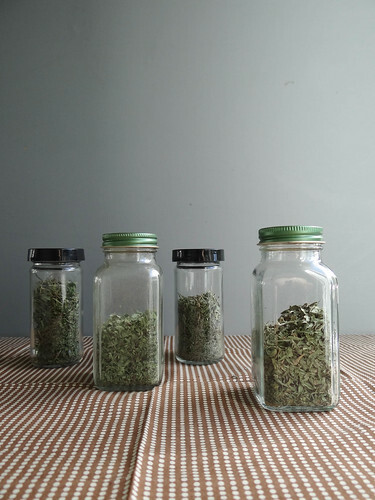 Do you still grow your own herbs at home? Ha! Now that I think of it years ago I was a professional herb drier - my green thumb extends to the outdoor growing realm, I have a hard time keeping houseplants alive, Justin is in charge of those! So easy, and so why do I never do it??? Time to change that! I tried drying herbs in my dehydrator once. It worked fairly well, but it seems like this technique would work better! You are getting to be a DIY queen! I have been loving putting together this DIY series, it has been so much fun! You're so talented! If I ever have an herb garden (any garden!?) I'm definitely trying this method! What I great idea, I should give that oven method a try, thanks for sharing your tips! I so need to do this! So far I've only tried growing a few herbs, but next year I definitely want to expand. There's usually a week or two during the summer where I get really forgetful and don't water as often as I should, which has been a bit of an issue in the past... but I'm determined to get better at gardening, haha! Earlier i thought drying all herb blends and preserving them is a tedious task. But when i saw my wife doing it, I came to know this is really simple. So now at times i may also help her. But drying Tender broad leaved varieties can be a bit trickier, as they are easily affected by moisture and can quickly turn moldy if not dried properly.